I received James Beard’s Love and Kisses and a Halo of Truffles as a gift about a decade ago, when I was deep into Julia Child and M. F. K. Fisher. All this time, it had sat there patiently on the shelf. About two weeks ago, in search of a change, I picked it up, read the first few pages, and was quickly hooked. It’s a compendium of Beard’s correspondence with his dear friend and collaborator, Helen Evans Brown, ably edited by John Ferrone. Because the book is entirely letters (“epistolary,” in literary parlance), you can read one or two, put it down, and come back a week later without missing a beat. I’m having home economist battles. I couldn’t use tarragon in the mustard sauce I did, so I substituted rosemary. The home economist sent word that since a housewife would have to have a mortar and pestle for the rosemary, she was changing the herb to oregano. I also had called for grated onion, and she said it should be minced because a housewife had no Mouli, which she presumed I had used. I said I was being paid to create flavor and that she should keep rosemary — it didn’t need any mortar and pestle — and that I grated onion because I wanted the juice, and it was done on a dime-store grater. Beard was a consultant to French’s Mustard, Green Giant, and many other products that routinely showed up on grocery shelves and kitchen counters, hence his need to work with corporate home economists, about whom Helen Evans Brown complained as well. By the late 1960s, however, the legions of American “housewives” (doesn’t that term seem quaint now?) these gatekeepers so zealously guarded were in the kitchen with Julia, Mastering the Art of French Cooking. How far we’ve come in our culinary knowledge and skills, and our willingness to reach across cultural boundaries! Beard would have been very happy, I’m sure, to see our own elementary school grands enjoying sushi after their day at the park. You’ve probably heard about the James Beard Foundation book awards*, but there’s more to learn about Beard’s truly extraordinary career, and how his equally extraordinary legacy survives, on the James Beard Foundation website. Note as well that this book is a fine example of how personal correspondence developed and maintained relationships and shared knowledge and insight across the miles, which I’m sure is hard to imagine for younger people so reliant on 21st Century social media. *My friend Laura Schenone’s A Thousand Years Over a Hot Stove was a James Beard Award winner. I did not know that about his work with American companies and consequently, home economists. It’s interesting, Bobbie, contiguous with the rise of Madison Avenue. 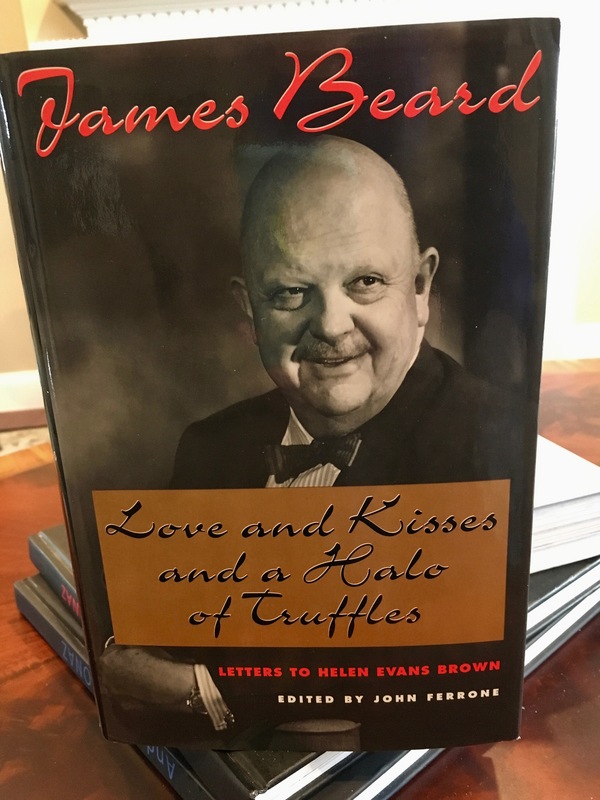 Angela, thanks for sharing your thoughts on James Beard’s Love and Kisses and a Halo of Truffles. I’ve not read this, but will now see if the English version is available here. I quite enjoy books on food history and such. Anxious to hear your opinion if you find it. If you don’t, let me know. I’m glad you finally got a chance to enjoy the book as it does sound very interesting.